This is early on, when I wrote everything on Matthew's "life" calendar. That's why you also see him waving "hi" for the first time, scooting around, and blowing raspberries. This is early on, when I wrote everything on Matthew's "life" calendar. That's why you also see him waving "hi" for the first time, scooting around, and blowing raspberries. You can clearly see that he ate rice cereal four times, then took a week off (my husband was in Taiwan, and "feeding" a six month old just wasn't at the top of my to-do list). Then on both the 11th and 19th he ate rice cereal again and started throwing up, with repetitive diarrhea on the following day each time. After that, you can see that Matthew started peas the week of the 24th, and then had a reaction with the same vomiting and diarrhea pattern that rice cereal had caused earlier in the month. That was it...this calendar was all I needed to show for him to be diagnosed by specialist who was knowledgeable about FPIES. She recognized the pattern, because it was right there in front of her. OK, so now you see how powerful a journal can be. Some parents keep a notebook with all of the foods and symptoms in it, some write it down on a paper calendar, and there are even food journal apps out there for your smartphone or tablet. Some keep a poop journal with photos instead of just describing it (I'm SO doing that if our next kid has FPIES). No matter how you do it, keep some type of food and symptom journal. Whatever type of journal fits best with your lifestyle, that's the way to go. 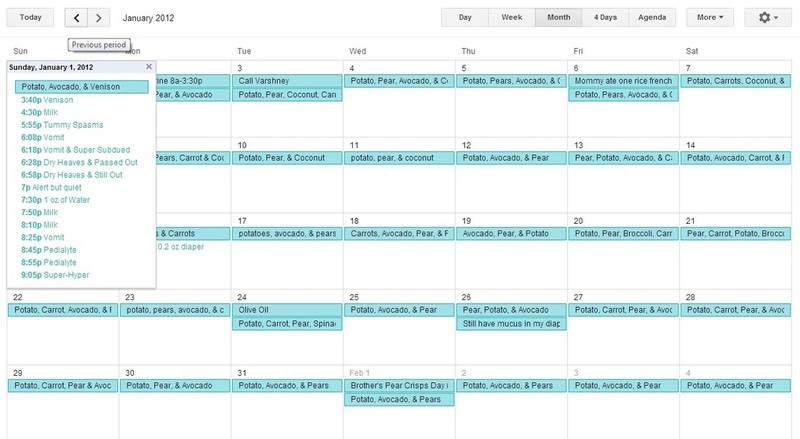 Since I keep all of our calendars in Google Calendar, using it to keep food journals and symptom logs just seemed like the right answer for us. I've always kept a calendar for both of my kids using Google Calendar so that I can look back and see when their first tooth came in, when they took their first steps, or when they took their first bite of food. Once we knew we were dealing with FPIES, I decided it would be best to keep a symptom calendar separate from Matthew's "life" calendar. He doesn't need to look back at this someday and see diarrhea listed next to milestones like crawling and his first word. So I changed it up and added a food calendar for Matthew, a food calendar for myself (because we were breastfeeding), a poop calendar (for noting odd smells, mucus, etc. ), and a symptom calendar where I could note diarrhea, vomiting, etc. I won't lie to you...I was sick of journals when everything was at it's peak. I was keeping track of: Matthew's foods, Matthew's poop, Matthew's symptoms, my foods, and the "pumped on date" for his bottle. Every. Single. Day. It was enough to make me want to run away screaming. To just have an irresponsible day, one single day, that didn't require me to keep track of every single detail of our lives. I'd even go on strike for a day, pretending that everything was normal and carefree...then the next day I'd come to my senses and scramble to get everything down before I forgot. It was hard, and it all fell on my shoulders because I'm the primary care giver. Nick would have relieved me of this burden if he could, but he wasn't home for each meal, each diaper, each symptom. But it did get better....with time. At least Google calendar made it really easy. 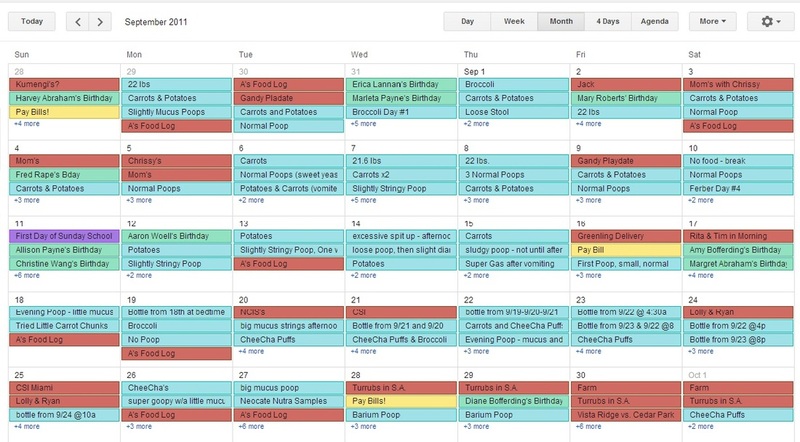 You can color code calendars and layer them on top of each other. You can turn calendars on and off. You can share calendars, so my husband could see what was going on with Matthew by looking at his own calendar. You can look at your calendar for just a day, for a week, or for the month (which you see above). Take the calendar above...I really have ten calendars in Google, but I turned all of them off except Matthew's and printed what you see above for our allergist appointment. That's the other awesome thing, I can print the calendar out for his doctors. His allergist literally has a record of every food eaten and symptom observed for Matthew over an entire year. For each appointment I would just print a copy of what had happened since the last time he had seen the allergist, and she kept them in his file. 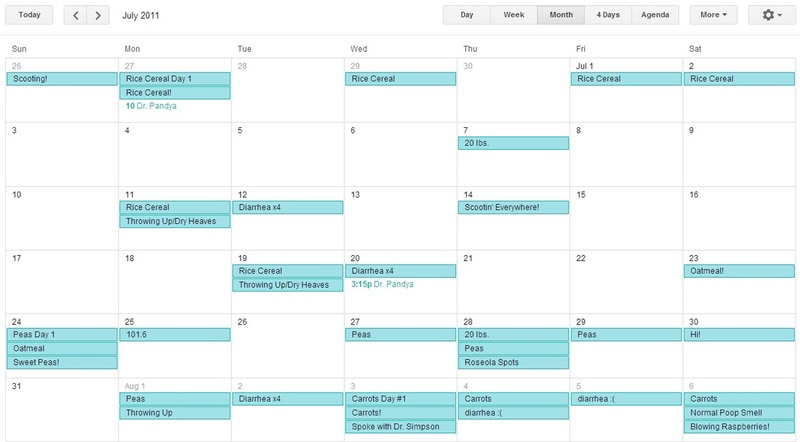 My unfiltered Google Calendar, with birthdays, playdates, travel plans, bill reminders, and even the season premiere of my favorite shows mixed in with food journals and reaction logs. 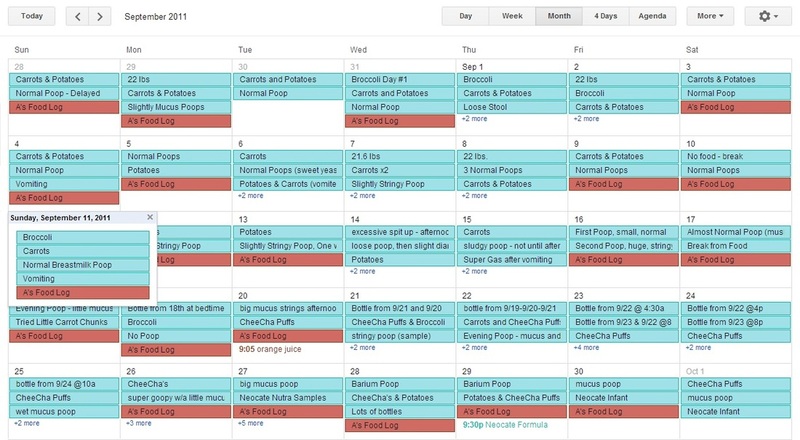 My filtered Google Calendar, only hsowing Matthew's food journal, poop descriptions, reaction logs, and my food logs. A filtered view of the FPIES related journals I kept six months after Matthew's diagnosis. As time passed and we became more comfortable with FPIES, our journaling dropped off. I no longer keep track of which foods Matthew eats on a daily basis...only noting the start of trials, breaks, passes, and fails on Matthew's calendar. I'm sure it will be the same with you. As your child adds more foods to their safe list and the FPIES mentality becomes second nature, your journaling will become much easier, and then almost nonexistent. FPIES will move into the background instead of taking center stage, and living with FPIES will just seem like your version of normal. You'll be too busy keeping up with your child to give much thought to FPIES, and that's the way it's supposed to be!